Do you know what could go wrong with the door lock of your house or office? If your answer is no, you’ve come to the right place. Here you will find details on the most common problems and their solutions. This could be due to key damage. Check the blade and pay close attention to the tip and the peaks and valleys. If you notice bending, denting or chipped off tiny bits, the only solution to the problem will be key replacement. Another possible cause to the problem is a blocked keyway. It could be filled with pollen, dust or even lint, if you have been holding your key in your pocket and have been transferring fibers to the lock over time. Cleaning and lubrication should be sufficient for dealing with this problem. The worst-case scenario is having a badly damaged or broken lock. In such cases, repair isn’t always possible so the only solution could be lock change. If this is necessary, you should consider getting a more advanced lock which would provide better security. You insert the key into the keyway, but it’s challenging to turn it. Wiggling the key a bit is a simple troubleshooting technique which usually helps to unlock the door. However, it isn’t a solution to the problem while lock repair is. Dryness is among the most common causes of this issue. Lubrication will help to eliminate it. 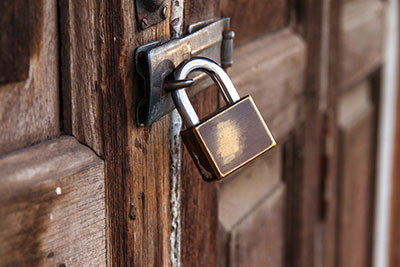 Just remember that you need to lube all exterior door locks at least twice a year to keep them in good shape. If there is something wrong with the internal mechanism of the lock, the repair will be focused on it. In case the key is to blame for the malfunction, replacing it is usually the most effective solution. It is worth noting that this issue is less common than the other two. Most often, the bolt gets stuck and cannot come out of the door jamb. If the strike plate is blocking it, it should be readjusted to prevent future trouble of this sort. When the strike plate is secured firmly in place, you will not have to worry about getting locked out of your house or office again. It is a good idea to keep a check on this component of the lockset and to tighten the bolts timely, if needed. The worse possible cause to this problem is a broken locking mechanism. Once it is replaced, things will go back to normal. 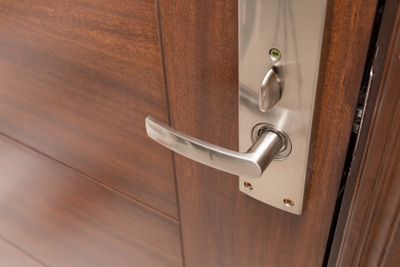 How can you prevent the most common door lock malfunctions? You should never push or turn the key too hard or slam the door to close it. Remember that even the toughest door lockset has sensitive components which are at greater risk of breaking and damage. Regular maintenance in the form of cleaning and lubrication will help to reduce the risk of trouble and to extend the useful life of the lock.